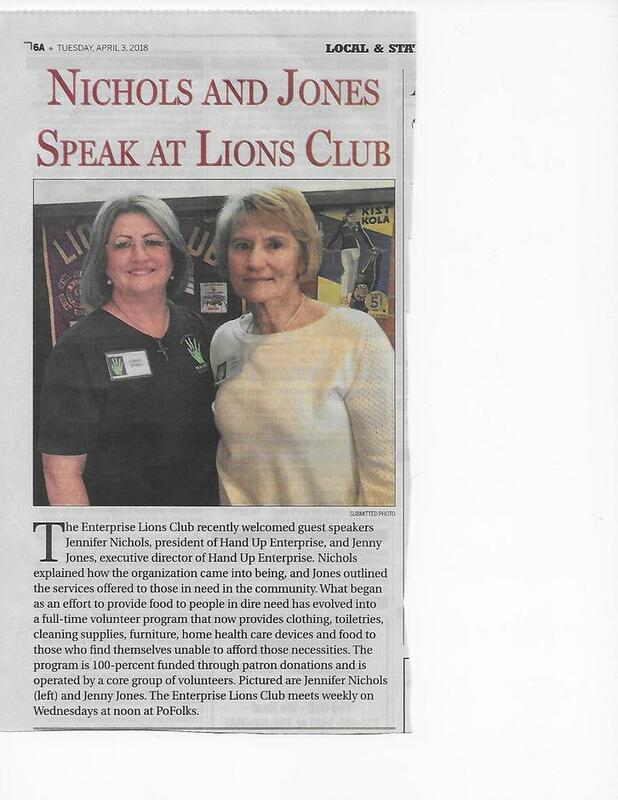 President Jennifer Nichols, Executive Director Jenny Linke Jones or any requested board memebrs are available for speaking engagements for your event / organization or club. The subject topic; what is HAND UP ENTERPRISE AL, what do we and why. Also we provide crucial information in determining IF an individual is indeed, homeless – or if they are scamming the public. These presentations are both eye opening and stimulating to the audience. We have been received well. It is our pleasure to accept your invitation. 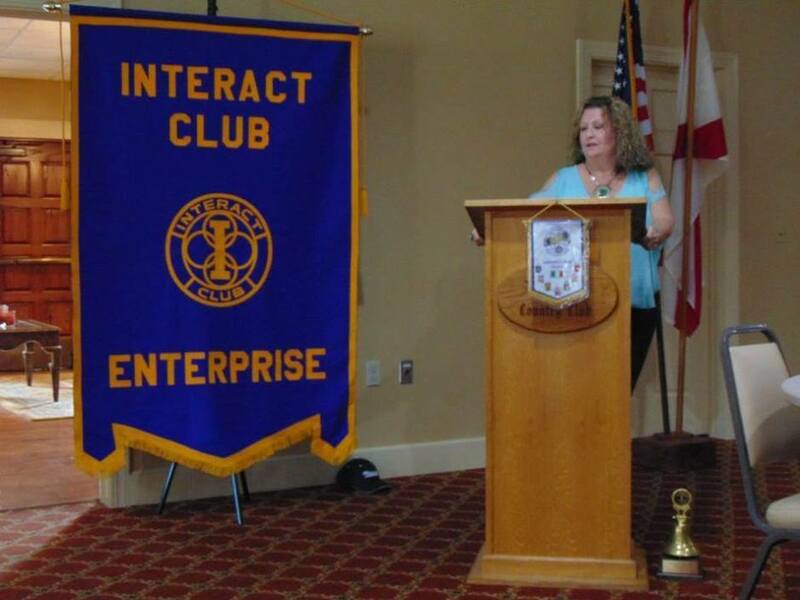 On December 2, 2016, Enterprise High School Interact Club invited HUE President/Founder Jennifer Nichols to speak to the club at their luncheon/meetting held at the Enterprise County Club. 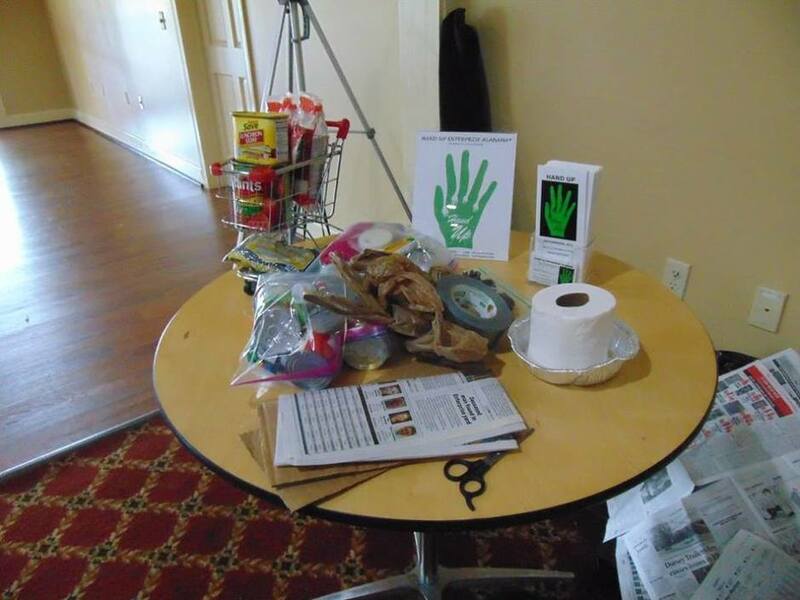 President Nichols brought items commonly used by the homeless population. 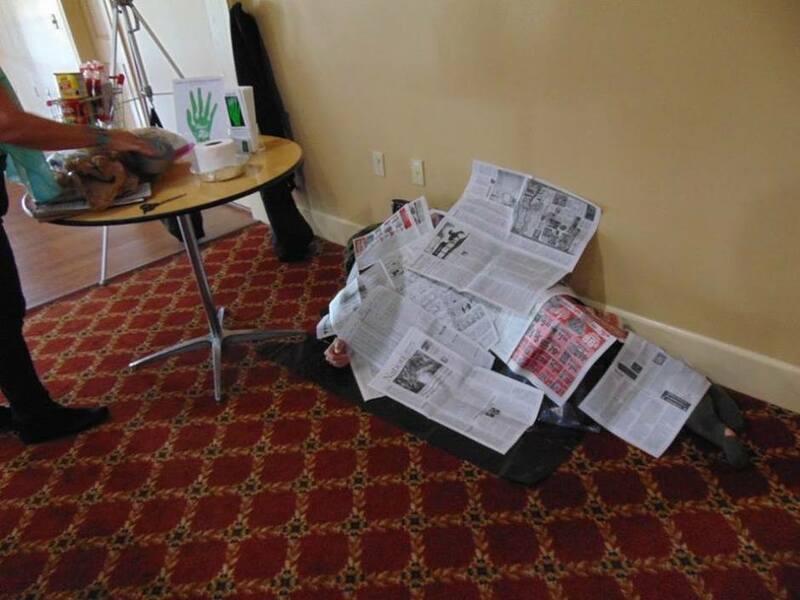 As part of her presentation Interact Club President Ryan Nagy arrived early and was positioned under newspapers and a black trash bag as a prop. President Nichols explained that in densely populated areas the homeless will sleep under newspapers and plastic bags for warmth and protection from the rain. As a result the homeless often go unnoticed by pedestrians. The presentation was very effective as many of the students had no idea Nagy was under the prop. 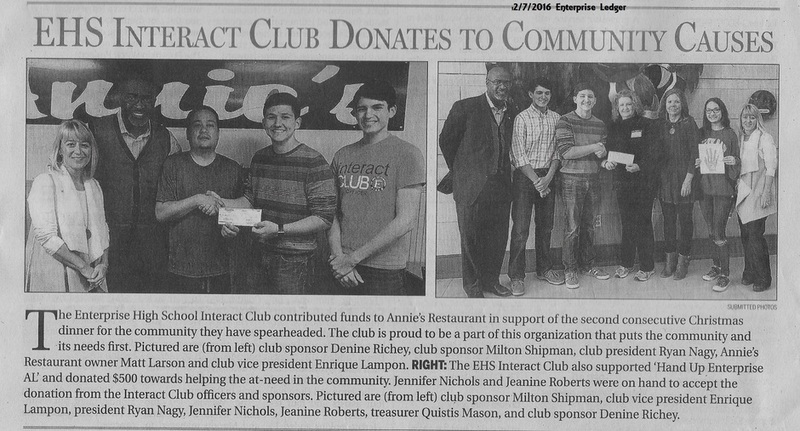 On December 7, as a result of the presentation the Interact Club made a $500 contribution to Hand Up Enterprise. This donation bolstered Hand Up's Christmas Gift fund. 46 children received 3 new outfits each and a modest toy. The following spring, members of the club interned at Hand Up! 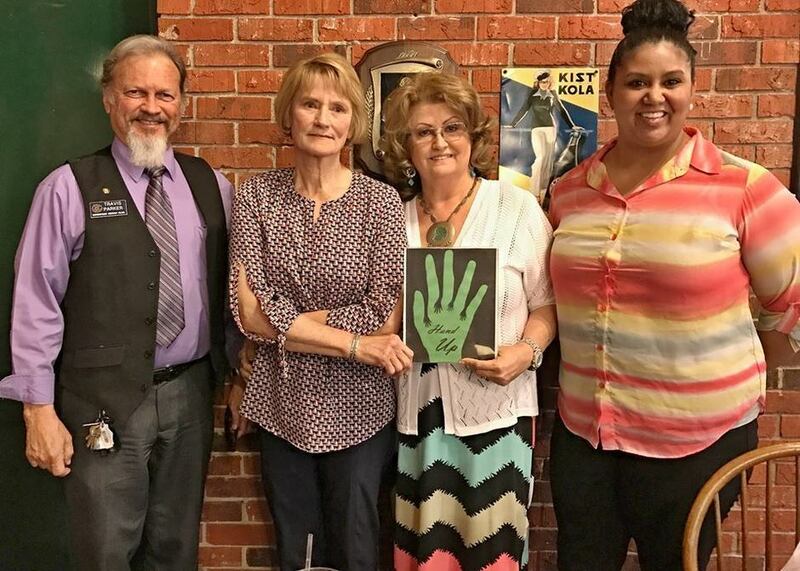 Medical Center of Enterprise Marketing Director Lisa Fenner invited HUE on April 11, to address the volunteer services employees at a luncheon meeting held at the Baptist Center on Lee St. There was quite a turn out of volunteers who asked many questions and shared their experiences with local homeless people. Most important discussion revolved around the safety of citizens being approached by "career homeless" who are NOT legitimate homeless but con artists preying on good people for quick cash. 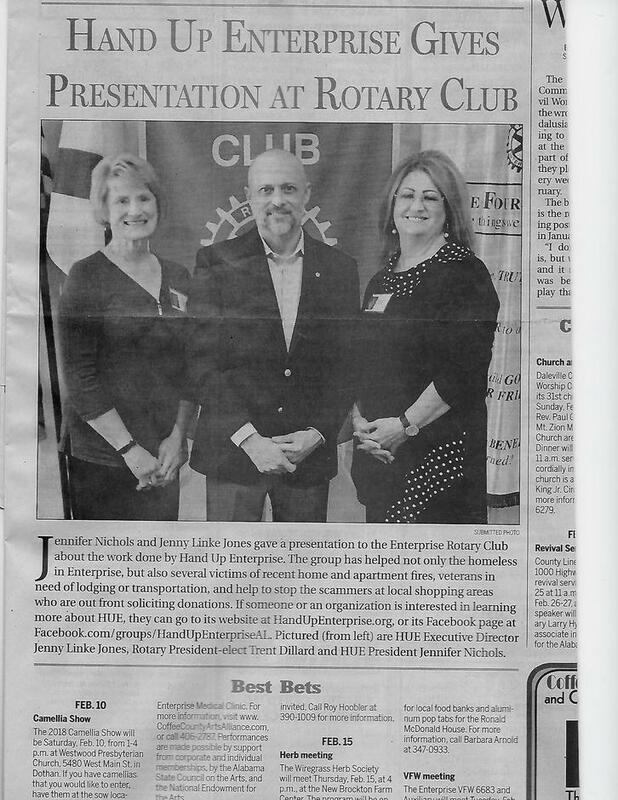 On April 11, 2017, The Enterprise Civitan Club invited HUE to speak to the club which met at Po Folks Restaurant. 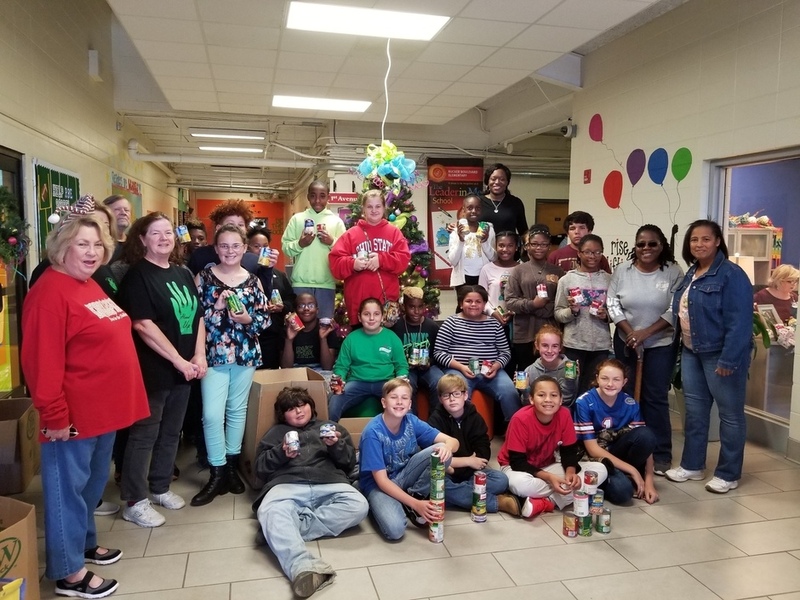 Executive Director Jenny Jones joined President Nichols in providing the history of Hand Up and the services it offers to the community. May 1, 217 Enterprise High School - Ms. Ashley Lucier – 10th grade English class invited Nichols to speak to two sessions. There was a lively question and answer period. Not surprising but very courageous one student admitted to the class that she and her mother were homeless, sleeping in a car just months prior. Another 5 students brought home information about HUE to their parents which prompted calls for much needed food.